1) Splash screen. 2) Select image from camera/gallery. 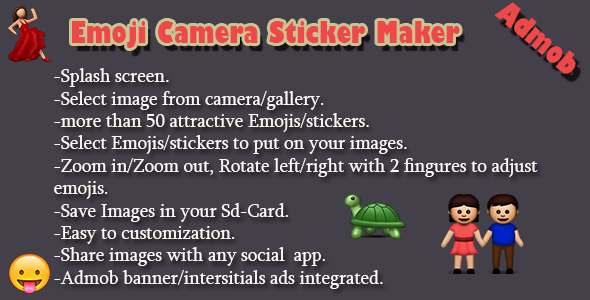 3) more than 50 attractive Emojis/stickers. 4) Select Emojis/stickers to put on your images. 5) Zoom in/Zoom out, Rotate left/right with 2 fingures to adjust emojis. 6) Save Images in your Sd-Card. 7) Easy to customization. 8) Share images with any social app. 9) Admob banner/intersitials ads integrated. 10) Easy to customization.